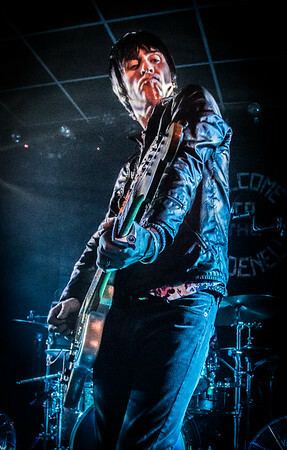 Leeds Brudenell is arguably the best-run venue in the UK. With its perfect PA, great atmosphere and policy of prioritizing bands and audiences, it’s a perfect example of a well run, friendly and perfect space for putting on gigs and should be used as an example to all venues if they need to know how to function. 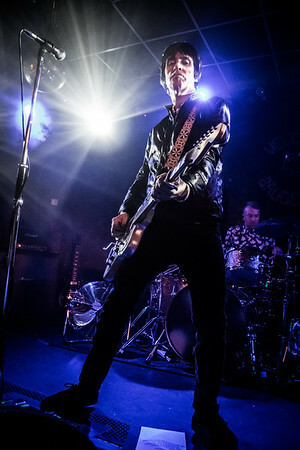 So it was fitting that Johnny Marr chose the venue for his first gig showcasing his great new album which somehow manages to combine those perfect Marr-lodies with a whiff of early eighties post-punk melancholy but also nods to that patented chiming guitar sound that he trademarked in the Smiths. The new album is his finest solo offering yet and the gig was a celebration of this and his own back pages. 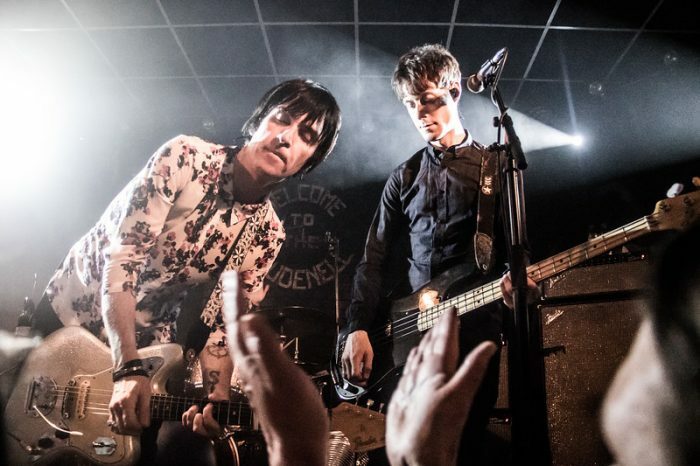 A sold out Brudenell was very hot and very sweaty even before Johnny took to the stage wearing a floral number given by fans earlier in the day which was not a breathable fabric and the garment clung to him like the dedication of the crowd. 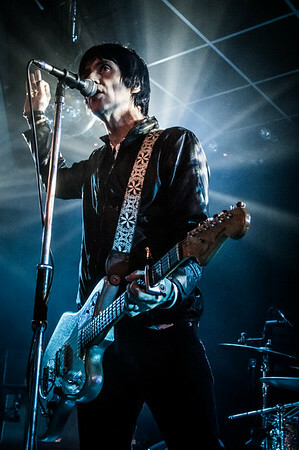 Johnny Marr started by saying “I said I’d come back here when the next album was finished, and I always keep my promises” After an audience sung There is a light” he said grinning ‘, I still like that music…I hope I remember the chords! ’ in a nod to his huge legacy and maybe to its a newly awkward position in popl’s hearts in the post-Moz interview climate. 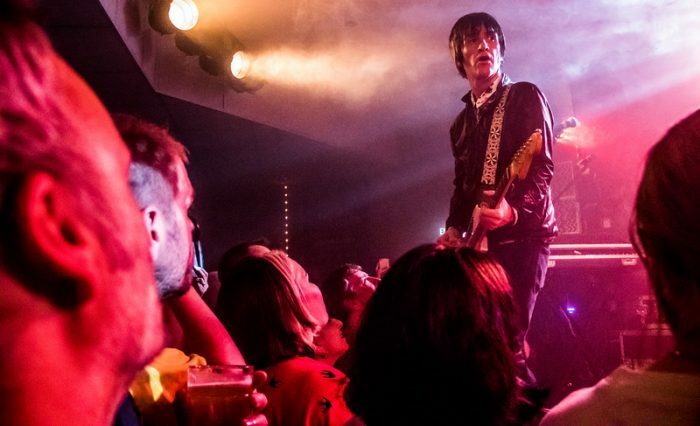 A climate where Marr has become the Smith to cling onto for the fervent fans who still love Moz but wish he would maybe not do interviews any more. Marr’s chord quip was inevitably followed by a finger fluff. Marr somehow remains the untainted eighties idol. His innate and deep understanding of rock ‘n’ roll has seen him examine the pratfalls of his own heroes and as he navigates his way towards elder statesperson status he somehow retains both a youthful vitality and a hunger for going forwards without the excess and clumsy stupidity of many of his contemporaries. On one level he has been handed the perfumed chalice of his much loved eighties band which he does embrace but is happy to move forwards with his own solo albums and has established himself as a mix of the two distinct eras and tonight is a perfect example of how seamlessly it all fits together into a continuous career whole in a sweatshod celebration of a decades long quest of guitar pop brilliance. Dying his hair & poor vocalist, whats not to like. Better a poor vocalist than being in a band fronted by a bequiffed Nazi though, eh?